Omaze has done some great work with the Star Wars and Star Trek franchises to bring a whole lot of money to various charities. The most recent collaboration for a chance to win a walk on role in Star Wars: The Force Awakens brought in over $4 million dollars, so it makes perfect sense for them to keep the donation party going on behalf of those who need help. A new collaboration with Omaze is underway that will see someone win a chance to meet the cast of The Force Awakens at the premiere of the movie. 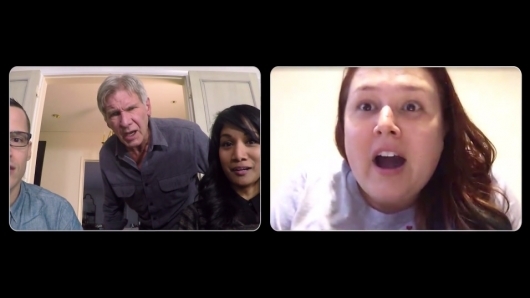 And to announce this, they decided to have a little fun and have star Harrison Ford show up and surprise Star Wars fans via webcam to great results. You can read more and watch the video below. Harrison Ford announces your chance to win a trip for four to the red carpet premiere of Star Wars: The Force Awakens! Every contribution benefits multiple causes nominated by members of the cast. With the help of Harrison Ford, Omaze announces a new campaign around Star Wars. This time, two grand prize winners will win the chance to bring three friends to meet the cast at the red carpet premiere of Star Wars: The Force Awakens in London or Los Angeles. out other once-in-a-lifetime experiences at omaze.com.